Shipyard workers check in to vote Sunday. BATH, Maine — Members of Local S6, the largest union at Bath Iron Works, have narrowly approved a four-year contract that calls for wage and other concessions as part of an effort to make the shipyard more competitive. The vote was 1,343 in favor and 1,045 against. "This agreement will help make BIW more competitive as we seek to win new work so we can continue to provide good-paying jobs here in Maine," a spokesman for Bath Iron Works said in a written statement after the vote. "We look forward to working with the union to effectively implement the important changes in this agreement." The company had warned that without the agreement, a bid for two-dozen Coast Guard cutters next year could be jeopardized and hundreds of layoffs could result. Some workers are concerned about having to contribute more to their pensions, expanded cross-training for other jobs and outsourcing of some work to independent contractors. "I don't really like the independent contractors but allowing us to do a little bit more than what we normally do, I can live with that," says Dan Murphy, a pipefitter from South Portland who has worked at BIW for 37 years. "It's not a real lot. I think we can live with it. "I voted to accept it because I really think we're not going to do any better in May," he says. "It's not a great contract but I can live with it." 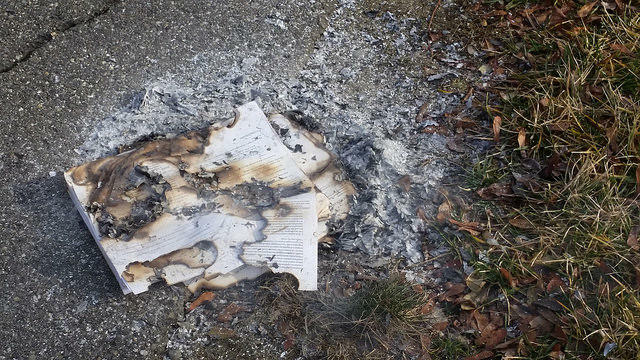 A burning copy of the union contract. Sue Buzzell, a shipfitter from Brunswick, says she's upset the contract passed. What bothers her, she says, is what's known as the L-40 classification. "And what that means is they're bringing people right off the street, no training, and wherever the openings exist — like they could come and you know, work with me," she says. "And I mean our job is not easy. I work on the erection crew. It's not easy at all." As part of the concessions, shipyard workers will have to forego pay raises in favor of annual bonuses. Some workers say the $2,500 bonuses don't cover a regular paycheck or the increased cost of living. Sam Clark is a welder from Manchester who says he understands that workers need to make concessions to make the shipyard more competitive. What he doesn't understand is why the company isn't offering to chip in. "I see this more as another company who is more concerned about their stockholders and how much money they're making," he says. "Because if they really wanted one shipyard and one future for BIW, where on their side are they giving? What are they willing to do to get these Coast Guard cutter contracts that they are telling us we have to do and pass this contract today?" 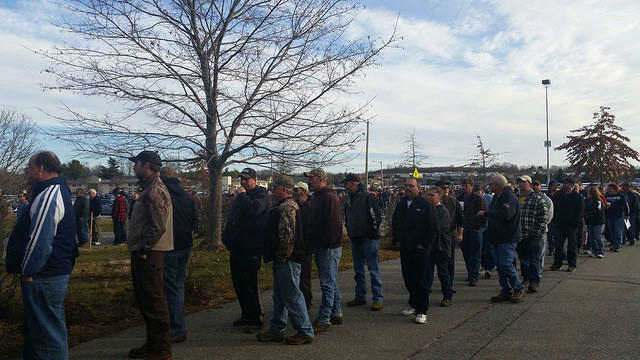 Shipyard workers line up outside the Augusta Civic Center Sunday morning. Workers began lining up at the Augusta Civic Center to vote early Sunday morning. Before 1 p.m., the votes were tallied. Local S6 President Jay Wadleigh, who didn't take a public position one way or the other, says every worker had to vote his or her conscience. "To each person something would mean a different thing, you know?" he says. "If your trade was getting merged, that meant something to you. If one of your jobs was getting subcontracted, that meant something to you. That's why I said it was a personal decision. You have to look at how it affects you, how prepared you were to fight, how you thought it would impact future bid competitions. It's a lot of factors to take in." Wadleigh says parts of the new contract will start Monday and the rest will be phased in over time. He says he's confident that BIW is in a strong position to win the Coast Guard cutters bid next year.